You may get some confused about what title is saying, if you so-The title is trying to say that we need to stop using default search option which is available in our computer (O.S) because there is a better alternative options is available for desktop search. 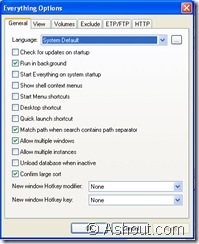 We all use default search in computer daily to search some file in our computer, and you may noticed that default search option takes some time to enter file name and we need to set parameter to search option especially in XP. You may find your correct result, but searching takes long time (minutes) to find it. But today I will show you a “Desktop Search Engine” to search files in our pc like a rocket speed. Today I am taking about Everything software a free desktop search software for all computer user. I agree default window search can provide good result when you search for a file, but it takes a lot of time to search it on computer. If you need a software to search on desktop with super fast speed then I highly recommend you to use Everything desktop search tool. Everything desktop search application searches our computer for files in a fraction of second and you will be happy seeing the performance of Everything desktop search tool. Now in my computer I’m using Everything software to search files on my pc. Because I use my computer daily and sometimes I may need to search for particular files, instead of using window search option I use Everything desktop search engine to search files it can do search faster, simple to use, and saves a lot of time. Unlike other software, Everything desktop search tool is very small (334 KB) and also it comes with standalone and install/uninstall setup file. You can choose setup file according to your taste. It may be a small software, but it provides a lot of options to change default searching method. To see option just navigate to Tools >> Options. By default Everything desktop search tool search includes hidden files also if you don’t want to include hidden files open Options and select Exclude tab in that you will see options “Exclude hidden files and folders” and “Exclude system files and folders” check it and save it. In one word I can say, Everything is an excellent desktop search engine and everyone need to try it.